Triple-digit Texas weather is tryin’ to kill us, y’all, no lie. Seems like a good time to explore more of our WDDI Guide to Summer Fun in Denton and the CVB’s Denton On A Dollar to explore indoor adventuring as we scamper for A/C. This week of #DENTONING has tons of fun to look forward to, but here is our top #DEN10 events to keep us hopping from shade to shade. As part of GDAC’s ongoing 50th Anniversary celebration, the Denton Community Market, local artists, Market members, and creatives bring you a Kid’s Art Party! Denton Community Market and their community of vendors will provide a variety of arts and craft stations, environmental and farm education activities, and more! Learn about the Market, local farmers, local artists, and enjoy a variety of all-ages family fun. Pucker Up!! Armadillo Ale Works' first ever Sour Ale will be on tap this Friday night and we’re gonna be one of the first to try the latest installment of their Taproom Only beers. They tease us that the fresh Guava, Mango, and Passion Fruit bring out delicate and tropical fruity flavors to contrast the tartness of this newest brew. With the Texas summer heat finally setting in, this one might not last long, so be sure to drink it up while you can! Another beer debut from Rabbit Hole Brewing will tempt your TGIF: Wine:derlust! A Saison ale aged in cabernet casks wafting with a symphony of fruits, spices, and herbal twang combined with the oaky notes only cask aging can impart. Savor Wine:derlust on draft at the bar, but bottles are also available for purchase! It's time once again for you Kats and Kittens to throw caution to the wind and invade the Abbey Underground to bravely celebrate Bone Doggie's ascent into decrepitude as he celebrates another notch in the gun and another nail in the coffin! Joining the celebration will be a macabre assortment of talented singers and musicians and surprise guests! The beloved Denton Community Market is the best way to ring in Saturdays, with all kinds of nifty crafty swag, produce, veggies, food, tours of the Bayless-Selby House, and live music! Browsing always pairs nicely with Saturday Jazz Brunch at The Chestnut Tree after some Yoga On The Square but expect traffic from the annual Denton Bridal Show. Language of Laughter hosts the THIRD ANNUAL Riveting Women Comedy Show, with proceeds benefiting literacy initiatives here in Denton, TX. To date, LOL has delivered over $20,000 in funds and resources to six schools and children's programs in Denton, so help ‘em continue the mission while laughing away with some of the funniest femmes in NTX! As the temperatures climb high, come sip a cold craft brewski and watch the shenanigans as Bearded Monks challenge Noble Rey Brewers to a ruthless showdown. The best lil’ community radio station in Denton celebrates their first anniversary with a night of wicked tunes and musical mayhem! Even Dallas snobs ranked it among this week’s 10 Best Concerts, so pace yourselves for a full evening. SundayFunday options include a Comedy Open-Mic where you can hear local talents polishing new material, and maybe try Dusty’s zany Hot Dog Month Challenge. Sundays are also Open-Mic Night at The Bearded Monk at 6:30pm, so its easy to enjoy a laugh-filled evening that get’s you amped for The Brave Boys at Dan’s on Tuesday nights. TEDtalks meets Drunk History in this monthly series of nerdy topics, geeky subjects, and smart infotainment. 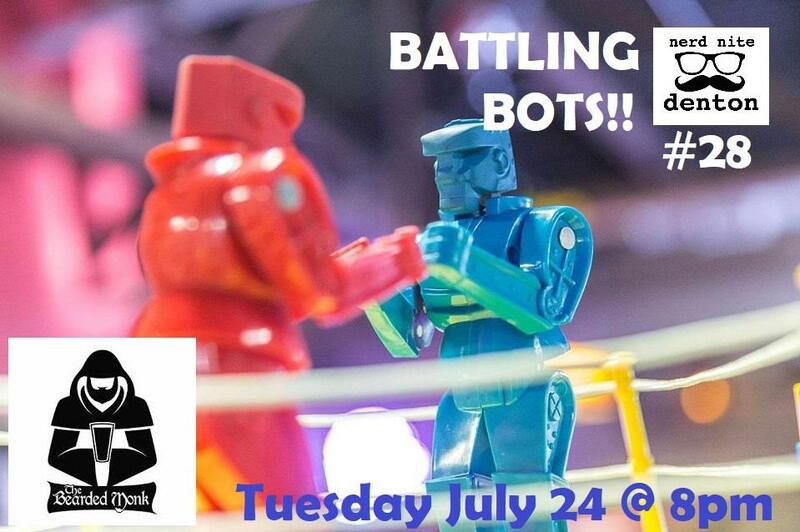 Bring pals to drink-&-think about Russian propaganda, Bicycles, and parade projects with more fun around this month’s theme: Battling Bots!